I love the Baja Style tacos but the fish is deep fried, so I usually make a lighter, grilled version in my grill pan – it comes out just as good and is so easy. With just a few simple ingredients you can make a “do-it-yourself” assembly line. Fish - I like a combo of shrimp and firm white fish (Tilapia or Cod work well). For shrimp, I like to use bigger ones and cut them in chunks once they are cooked. Today, we're trying rock shrimp to change things up a bit. Season the fish with whatever seasoning you have on hand. Some ideas: lots of good cumin, sea salt, pepper, chili powder, some cayenne, a bit of Mexican oregano, a bit dried garlic and onion powder. Use store bought guacamole (Whole Foods makes a good one) or make your own: mash up ripe avocados then add finely chopped jalapenos, lime juice, chopped cilantro, finely chopped red onions, and optionally add finely diced tomatoes that have been de-seeded and drained of juices. Season with salt and pepper to taste. 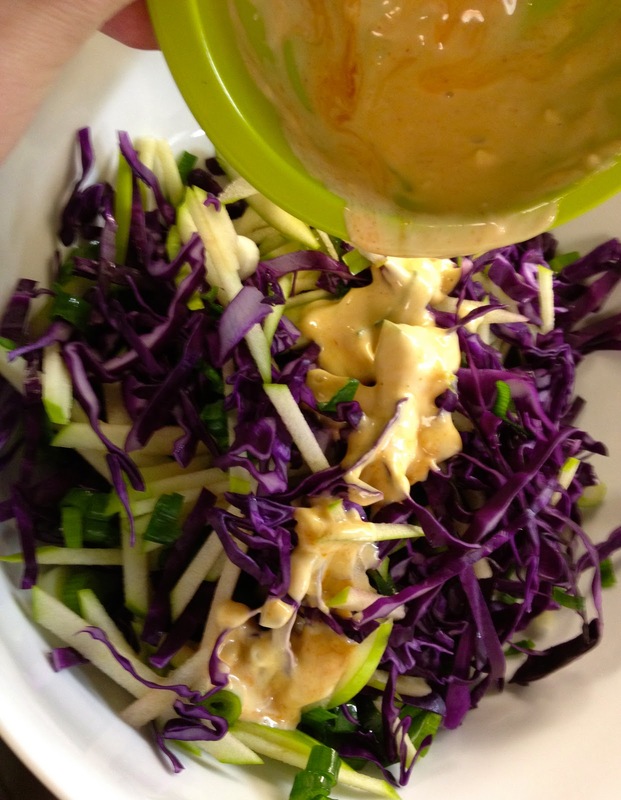 In a separate bowl, combine mayonnaise that's been thinned out with some apple cider vinegar. 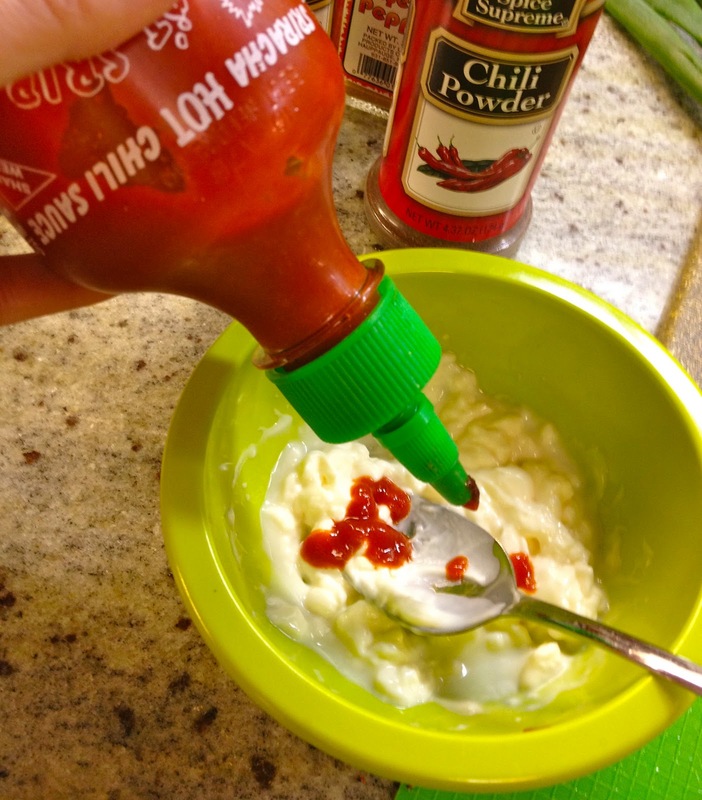 Add a few healthy squirts of sriracha, depending on how spicy you like it. Mix and season to taste. Toss sauce in with the slaw until incorporated. Grill the fish until  firm yet tender. 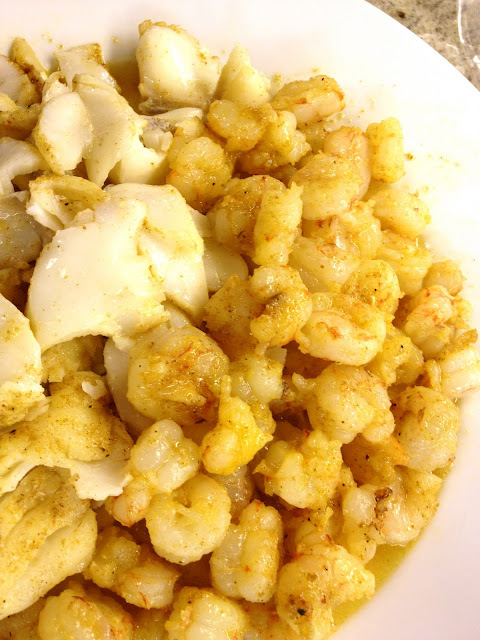 Shrimp cooks quickly, so if you are making a mix of fish and shrimp it is best to cook it in a second batch. Cook shrimp one to two minutes until firm and opaque. Cut or shred the fish filet into chunks. Serve: Lay everything out so people can assemble their tacos and EAT! I make either yellow Spanish rice from the pouch or basmati rice mixed with cilantro and lima beans - delish! Amy’s Low Sodium Refried Beans in the can is also a great addition. The accessible but pungent ancient Mediterranean herb with the friendly felt-like texture. With a soft, grey-green hue, sage makes a beautiful garnish, but its taste, distinct and earthy, makes it worthy of edible preparations. Sage is most often seen in homey dishes like oven roasted chicken. 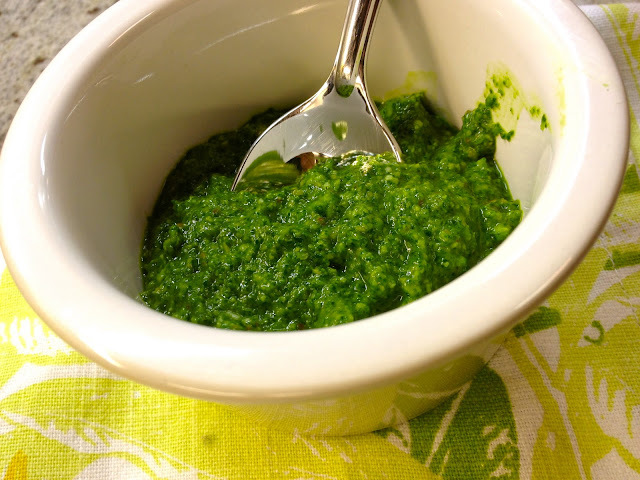 Its very pronounced herbaceous flavor can overpower a dish, but when used sparingly, it's great. Below, I've collected a few of my favorite recipes using sage, from a simple brown butter sauce, to an easy veggie side dish, to a crunchy sage garnish that heightens any humble dish to haute cuisine. A popular way to incorporate sage into a sauce is by way of brown butter, often seen on pasta dishes such as pumpkin tortellini or butternut squash ravioli. Sage is a natural match to fall and winter vegetables, and sage brown butter sauce is a perfect addition to any pasta or dish that can stand on its own but could benefit from a buttery, savory kick that will not overpower its taste. Best of all, Sage Brown Butter Sauce is super easy and fast to make. If preparing for pasta - 1 pound fresh pasta such as pumpkin or squash ravioli or tortellini. *I've prepared this sauce for use over pasta using much less butter and it works just fine. Be sure to adjust your sage accordingly. To coat, simply toss pasta and butter sauce in a bowl to ensure sauce is thoroughly incorporated. Wash and dry sage and tear the sage leaves into small pieces. Allow butter to begin sizzling and allow it to begin to brown – you should actually see it change to a golden color. Once this starts to occur, add sage leaves and fry for about 15-20 seconds. Remove pan from the heat and stir in nutmeg. Add a little salt and immediately pour butter sauce over the prepared pasta and sprinkle on any optional add-ons: chopped nuts (particularly hazelnuts), and grated amaretti cookies, or grated parmesan cheese. Roasted butternut squash with sage makes a nice accompaniment to oven baked meats such as pork or chicken. 2.5-3 lbs of butternut squash, peeled, and cut into a one inch dice. Two tablespoons olive oil, 12 Whole Sage Leaves. Preheat the oven to 425°. 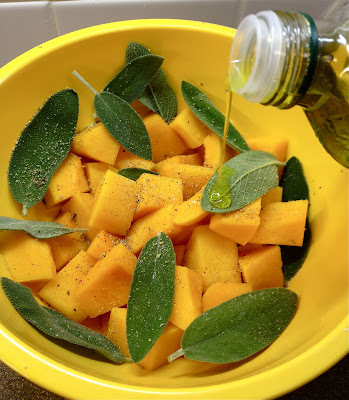 In a bowl, toss the butternut squash with the olive oil and sage and season with salt and pepper. Lay the squash and sage on a baking sheet in one single layer. Roast in the oven for about 40 minutes tossing once half-way through, until tender and partially browned. Wash the desired amount of sage sprigs and leave to dry completely. Pull off the leaves from the sprig. Heat oil in a small, high sided pan over medium-high flame until hot. Fry only up to 8 sage leaves at a time until crisp, 2–3 seconds. Remove quickly using a fork or small metal strainer, and sprinkle generously with coarse salt. Sage will crisp as it cools. 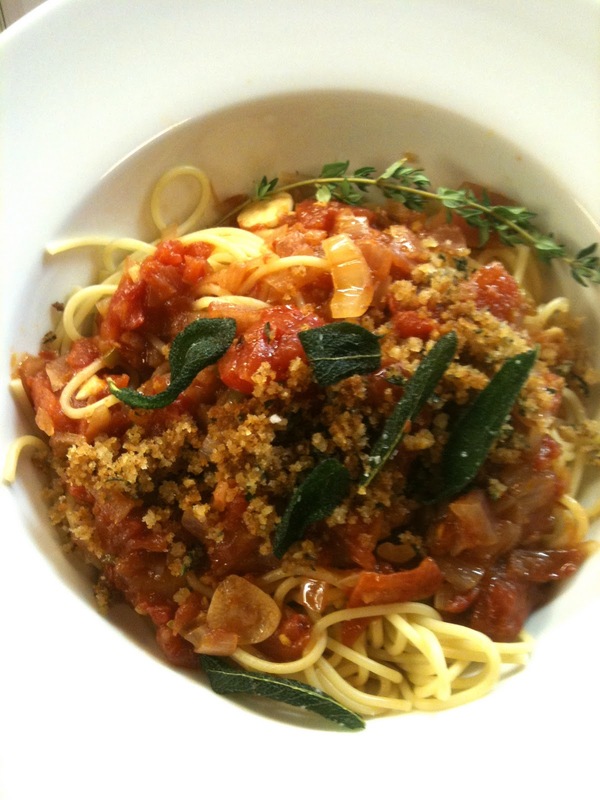 Next up, what does an Englishman know about Spaghetti All'Arrabiata? 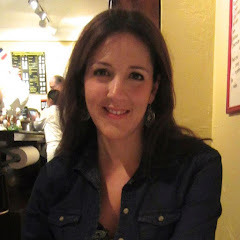 Take it from this Italian, Jamie's is one of the best versions of this spicy tomato sauce. I think the textural addition of fried, thyme scented breadcrumbs and crispy fried sage are what sends it over the top. Heat about 5 tablespoons of the oil in a large sauté pan over low heat. Add the chilies, garlic and onion, cooking gently for about 3 minutes. Add the tomatoes and let them cook until the sauce is quite thick, about 20 minutes. Meanwhile, bring a large pan of salted water to a boil. Cook the spaghetti in the salted boiling water according to the packet instructions. Drain the pasta, reserving about 1/4 cup of the cooking water. Fry up sage leaves according to above recipe if using. Set aside on paper towel. Once the sauce has thickened, add the red vinegar and season with salt and pepper to taste. Heat the remaining oil in another small pan over medium heat. Add the bread crumbs and thyme and fry until the bread crumbs are crispy, for about 3 minutes. Add the drained pasta and the reserved pasta water to the sauce, and toss to coat. Drizzle with a bit of extra-virgin olive oil and serve with the breadcrumb and thyme mixture over the top. Finish with a garnish of fried sage leaves. Some veggies don't get no respect. 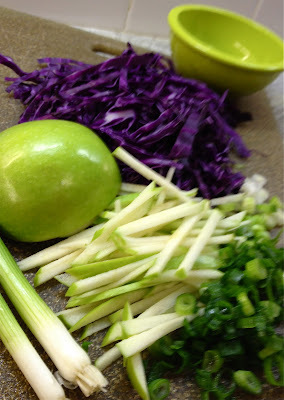 Many of my favorite vegetables are those that don't exactly get a warm reception from the average eater. Turnips, Kale, Brussels Sprouts and Fennel aren't the biggest crowd pleasers, but because they happen to make great winter sides, I decided I'd feature them, and some easy ways to prepare them, in an ode to the lovable losers of the plant world; I dedicate this post to all the Rodney Dangerfield-esque veggies out there waiting for their moment in the sun. Thankfully, the farm-to-table movement has done much to increase the good press on overlooked vegetables. 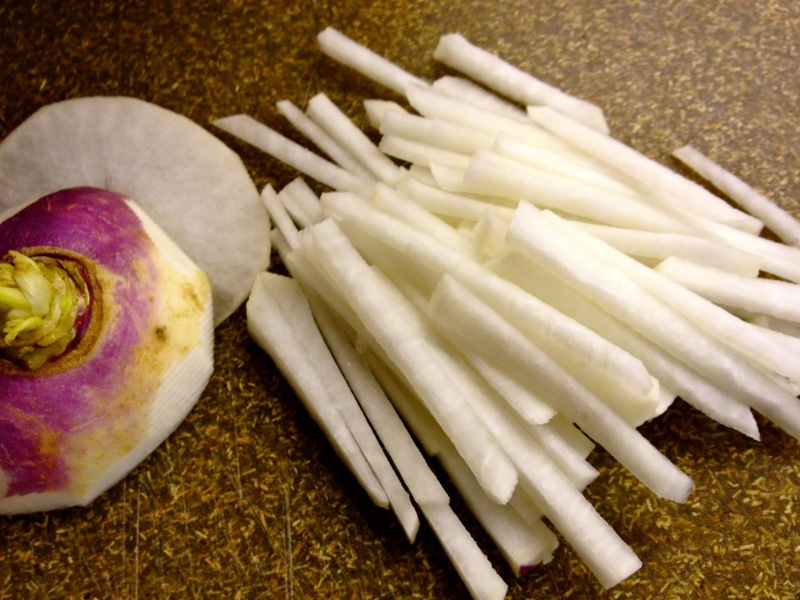 Turnips and Kale are enjoying a real uptick in popularity that is well deserved. They are both super healthy members of the Crucifer family of veggies, a group so named for the cross shaped formation their leaves create when in bloom. Some other notable crucifers include Brussels Sprouts and Broccoli. Cruciferous veggies are especially packed with vitamins and fiber, and they boast quite a few disease figting qualities. Kale, in particular, has the most Vitamin A of them all. Prepare Dressing in a small bowl by mixing Olive Oil, Honey, Lemon Juice, Salt and Pepper. Next, toss Kale, Turnips, and Dressing in a bowl and let sit at room temperature at least ten minutes. This will help the kale break down a bit, tenderizing while absorbing the flavors. Put Salad and Dressing in a Gallon Ziploc bag, leaving partially open for air to escape. Press the bag down on a flat surface and move the contents around with fingers and palms. 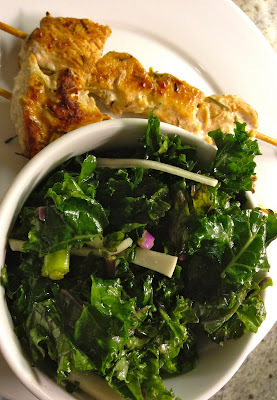 This will both distribute the dressing and massage the kale with the acidic dressing to help make it tender. Let sit for at least ten minutes. Enjoy! What else can you do with Kale? Why not buy extra and whip up this super easy, fast and healthy soup that will feed you for days? Any sturdy soup green works well, especially escarole. Alongside a sandwich or salad or served with crusty bread, it makes an easy and nutritious weeknight meal. Heat the oil in a large pot over medium-high heat. Add the garlic, celery, onion, 1 ½ teaspoons salt, and ½ teaspoon pepper and cook, stirring once in a while, until veggies get tender, 4 to 6 minutes. Add the beans, pasta, kale, rosemary, 7 cups water and 1 cup vegetable broth, and Parmesan rind. Reduce heat and add crushed red pepper simmer until the pasta and kale are tender, about 4 to 5 minutes. Remove the Parmesan rind. Stir in the lemon juice and sprinkle with the shaved Parmesan before serving. Optionally serve with crusty bread. 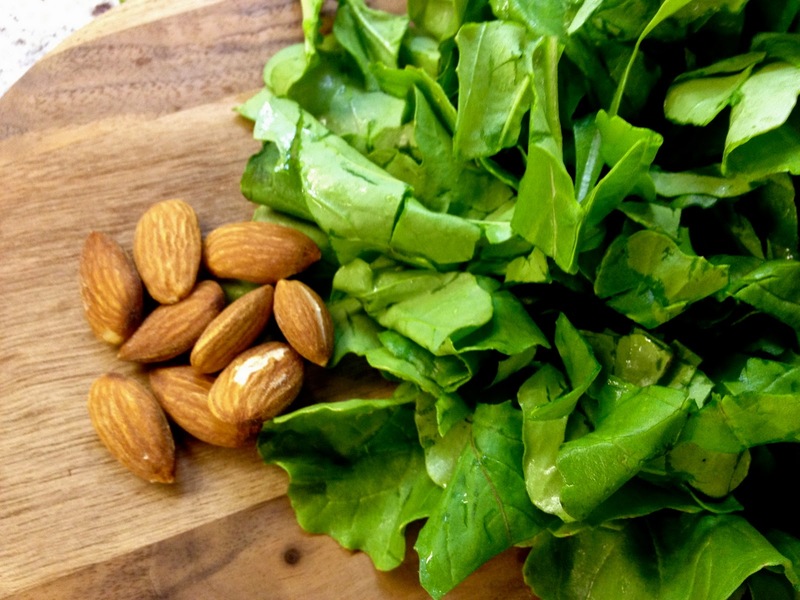 Flavor Pairings with Kale, raw or cooked: Golden raisins, pine nuts, or salty additions like anchovies, olives, or parmesan shavings. Yum. Packed with vitamin E, these little guys have a love 'em or hate 'em following, but you'll find that those who are pro-sprout seem to speak of them with great passion. I love brussels sprouts. Although, I admit, they're a slightly acquired taste, I feel that the strong negative sentiment around brussels sprouts is more a result of bad preparation. Boiling brussels sprouts until fully cooked is probably the worst possible way to serve them. It increases their smell, not in a good way, also making them mushy. Perhaps you have a hair-raising childhood memory of this? I think we all do. When prepared well, brussels sprouts can be absolutely delicious, even without the (heavenly) addition of temptations like bits of bacon so popular in sprouts these days. 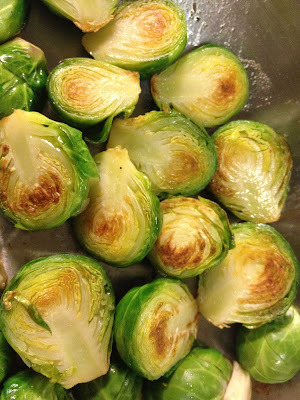 Below is one of my favorite every day sprout recipes that uses braising to maximize taste and texture. Add oil and butter to a medium sauté pan. Melt butter over medium heat. When butter is melted, shake the pan to cover the bottom with oil and butter totally. Place Brussels Sprout halves, cut side down, in the pan - as many as you can fit. Cook 4 to 5 minutes or until slightly browned and golden (see photo above). Add broth to the pan, pouring until liquid reaches about halfway up the height of the sprout. Allow liquid to reach a gentle boil. Lower the heat to a simmer and cover. Cook another 7 minutes for al dente or 9 minutes for slightly more tender. Drain off the liquid and season liberally with salt and pepper to taste. Serve! 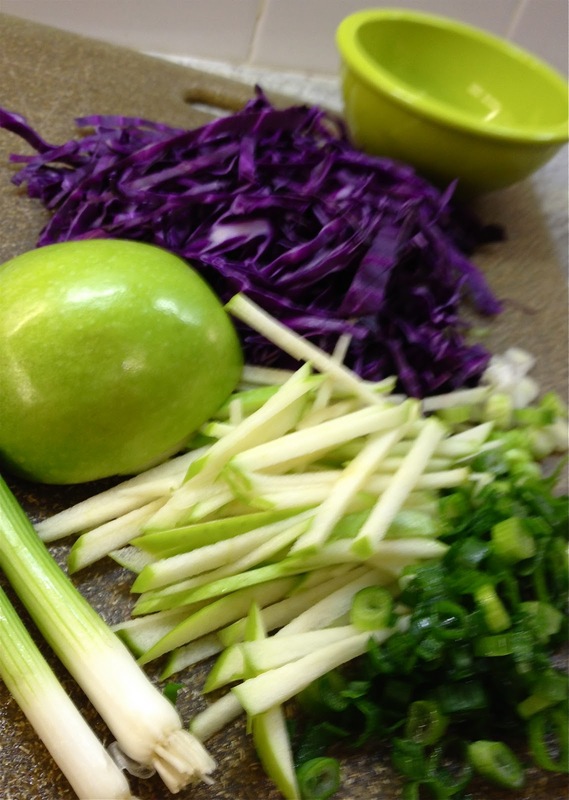 Unlike the rest of today's featured veggies, Fennel is not a member of crucifer family. Instead, it is a cousin of carrots and celery. Fennel gets a bad rap chiefly because of its ever so slight licorice flavor. Though the licorice quality is more intense in the leafy green fronds, the actual bulb has only a mild anise taste. When prepared raw, adding boldly flavored accompaniments such as citrus and olives can balance the licorice taste nicely and minimize it for those that don't care for it. I highly recommend giving it a try! If you are still not sold, try out fennel cooked. When roasted, it sweetens and caramelizes beautifully, losing nearly all of its licorice taste in favor of a more mellow yet still pleasing flavor. Here's an irresistible and easy roasted fennel with parmesan recipe from Ina Garten. Serve it alongside any protein, particularly pork roasts: Click HERE for the Recipe. One ripe blood orange, or regular orange, peeled and segmented. 5 or 6 small radishes thinly sliced. 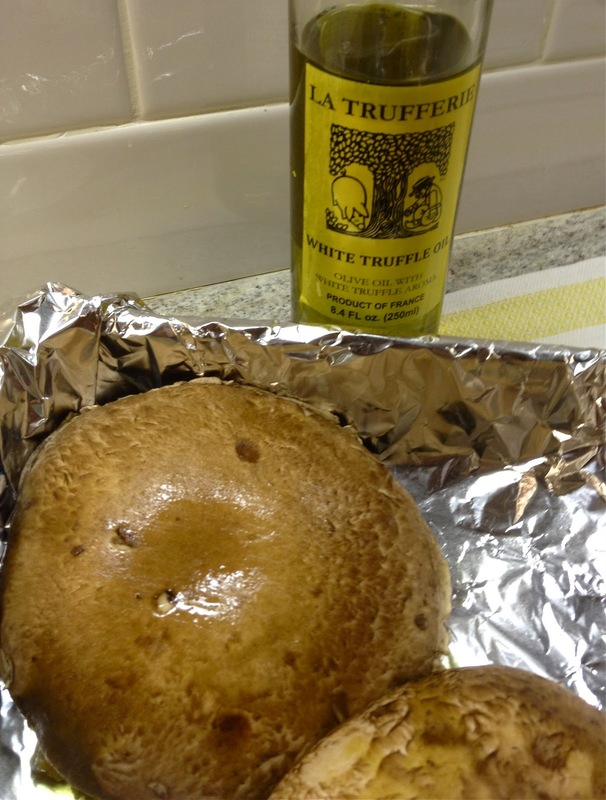 1 Tablespoon Extra Virgin Olive oil or other light tasting oil such as grapeseed oil. Take 3-4 orange segments and juice them into a small bowl. Add rice vinegar, oil, and salt and pepper to taste. Mix well. Next, chop the remaining orange segments into fourths and add to a separate bowl along with the watercress, radishes, and fennel. Before serving, dress the salad and toss. Taste for seasoning and enjoy! Food Pairings: This salad makes a wonderful accompaniment to any firm, white fish, or even salmon or arctic char. The salad works with a variety of citrus fruits, but if you can find blood oranges, they have a stunning color and an intense citrus flavor. * A high end mandoline is a great tool to have, but the $20 OXO Brand Hand held Mandoline works just fine for thin slicing. It's a must have because it makes slicing fast and uniform, and oh so pretty. Check it out HERE .